With the sweet little down-time available to indulge in over this past summer and spring, my very first chance to head out for a short dig did not come in April of this year, or May. The summer of 2010 has taken me on a whirlwind tour of both northern and eastern Canada. From nearly Pond Inlet, NU to Halifax, NS – my distance traveled spanned some 20,000km, and entailed nearly 50 hours spent in various aircraft. Under the guise of a “summer job” and “school” of all things, I was lucky enough this year to travel to some of the most startlingly beautiful places I have ever visited, and certainly some that I (and most other people) would never have expected to. 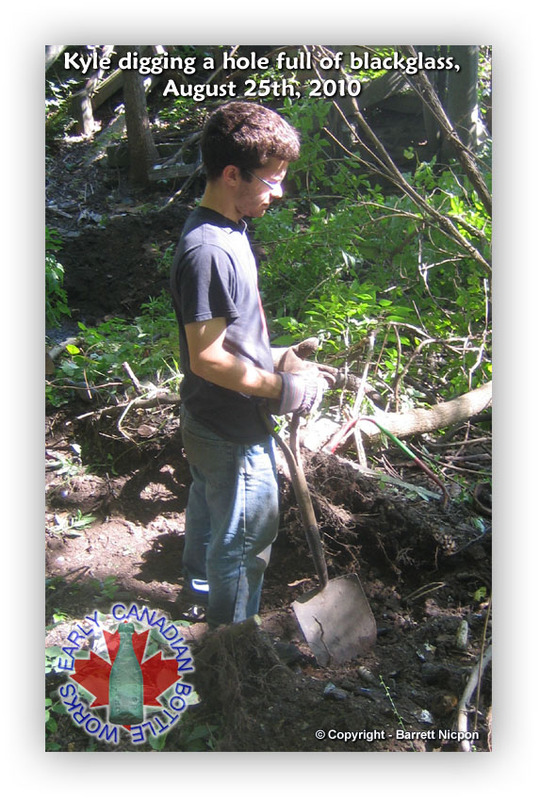 With only my precious 3 weeks total of downtime, I continued to pursue the artifacts of local historical significance that I spend hundreds of hours each year out searching for – digging in ditches, old refuse dumps, and walking dozens of kilometers of rail lines and farmers fields. The requirement to stay indoors for numerous excessively hot days this summer did not help my situation. The question this year was – would I have enough time to find “the big one”, or anything at all? I returned on August 23rd from my summer job as a student geologist at an exploration-stage iron mining company on northern Baffin Island. I had been gone for 40 days, and I knew I was slated to leave for the Maritime Provinces for a 10 day field course on the 1st of September. This left me only just over one week to relax, spend time with friends, and hopefully get in just one bottle or insulator dig to satisfy my craving to get dirty! My 1 week off, with everything I was trying to cram into it, was probably busier than much of the time I had just spent working over the summer. 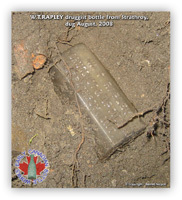 So it came to be that the 25th of August, 2010 was my first chance in that year to get out and look for some bottles. I picked Kyle up at about 9 AM, after sleeping in for a change. We had a few errands to run, including picking one half bushel of pickling cucumbers to make home made pickles. Errands occupied much of the morning, and our dump visit was finally had sometime around 12:30 PM, after eating lunch. 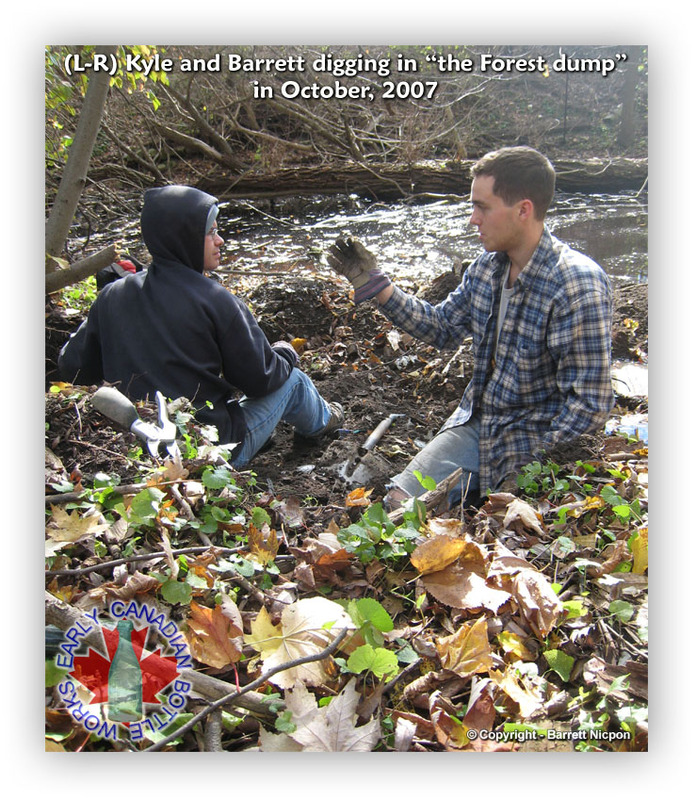 The dump we had been digging in is one that Kyle and I discovered back in 2007 while perusing some woodlands in the hopes of stumbling across something in the way of a dump. We happened to spy a few stray shards of glass and one complete furniture polish bottle protruding from the ground. Fast forward to 3 years later, and we’ve punched more than a dozen substantial holes in the landscape around this dump, and have extracted dozens of excellent local medicine bottles, and a variety of other odd pieces from around Ontario. One bottle variety the dump had always refused to produce is any variety of soda bottle from the earlier ages of the dump. We have estimated the age of the dumping to be sometime from around 1900, to around the early 1930s. Screw-capped bottles are rare in this dump, with most examples being ground-lip if any are found whatsoever. Of interest in this dump is an exceptionally high incidence of “throw-backs”, or bottles which predate in manufacturing the age of the dump in which they are found. 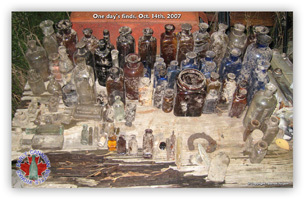 Large parts of the dump contain abundant medicinal bottles from the 1890s to the early 1900s, mixed with cork-topped sauce and crown-topped soda bottles from the 1930s. Although nothing absolutely amazing had ever been discovered, the occasional rare throw-back has continued to make visits to the dump worth-while to dig. With any luck, today would be one productive day. Upon arrival, Kyle and I set to work (as always in these situations). The digging produced dozens of common unembossed medicine bottles, food & sauce bottles, broken preserve jars (including one clear Beaver quart), and the odd 1920s-30s heavy pop bottle thrown in for good measure. For reasons unknown, a particularly large quantity of automobile parts was dumped in this area, which makes digging challenging. There seems to be no end to the batteries, gaskets, knobs, grease caps, tire parts, and various other iron objects that always seem to get in the way of your shovel at just the right (or wrong) time. On this particular day, I was digging in one of these car-part rich pockets, which seemed to hinder each scoop of the shovel. With the dump almost 4’ deep in some places, a 3’ long iron bar protruding from the edge of the hole can very much frustrate the unmotivated digger! Being late August, it was quite a hot day the entire time we dug the area. Surprisingly, the mosquitoes left us alone, but the inevitable dry spell began to set in by around 3 o’ clock or so. We began to realize at this point that nothing but common bottles had been removed from the muck and iron-stained soil. Just around that time, we finally had a lucky break when I pulled from the dirt an intact 2 oz. 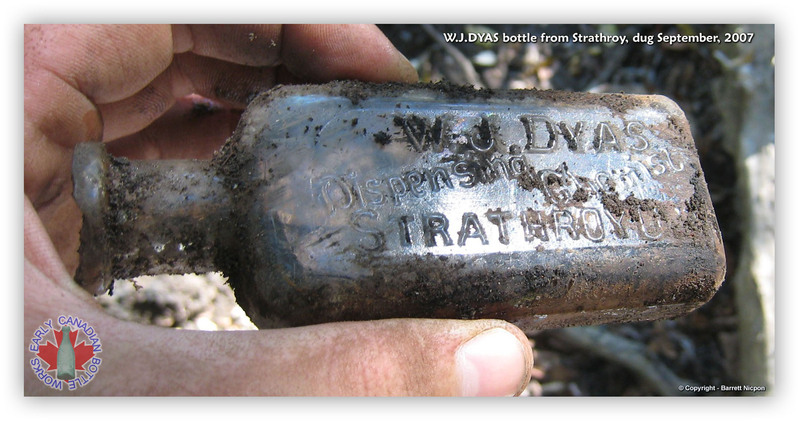 ornate “W.H.STEPLER” Strathroy dispensing chemist bottle, only centimeters under the surface. Despite being Strathroy’s most common local medicine bottle, Kyle and I have found surprisingly few of these aesthetically appealing bottles. Naturally, this made the day instantly productive! As 3:30 rolled around, it began to become apparent that this may become another day in our little dump that would produce little more than one local medicine bottle and a lot of decaying car batteries and gaskets from the 1930s. As I was pondering a possible location change to another area of the dump to start a new hole, I felt the satisfying “thunk!” of the shovel on an obviously intact bottle. As I cleared dirt away from the object at the deepest end of my 3 ½’ deep excavation, I could see the ground lip of an older preserve jar. With no sense for the colour of shape of the jar as of yet, I had the distinctive feeling the piece could be a Beaver jar. No less than a half dozen Beaver jars had been found broken in this dump so far – more than any other variety of fruit jar. I decided I had best be especially careful with this piece in getting it out. I set to work digging the dirt around the piece in order to more easily dislodge it from the ground. As more dirt cleared away from the piece it began to resemble a Beaver jar all the more. “Kyle, I think I have something!” I voiced to my digging partner. I continued to remove dirt from beside the jar, as Kyle stood beside me and watched. 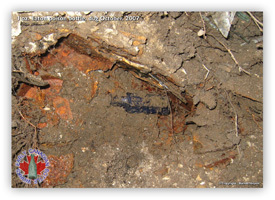 The shovel contacted something to the right of the jar with a hollow “thud”. At first glace the heavily crazed creamy coloured object that came partially into view looked like a portion from another car battery. I hurriedly removed dirt from around the object in order to clear it from the area I was trying to dig. As more of the object came into view, it began to resemble some sort of stoneware. “Don’t be so forceful with that…” Kyle seemed to plead quite suddenly, as if he had had some revelation about what it was I had found. At that exact moment, I had a revelation of my own. The size, colouration, and lustre of the object I had been impatiently trying to dislodge from the hole in order to get my preserve jar free closely resembled that of a one pint ginger beer! One final gentle pry of the shovel was all it took for the piece to become dislodged from the soft, black soil of the very basal layer of the dump. I reached into the hole and pulled the bottle free. Kyle was right in his suspicion. 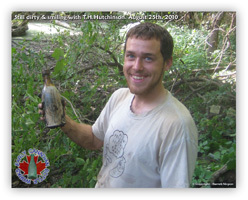 I was holding only the second intact ginger beer bottle I had ever excavated. In the moment immediately following the unveiling of the ginger beer, I still had no idea what marking the piece possessed, if any. The wet dark soil clung to the piece desperately as I quickly rolled it over looking for any of that tell-tale black ink. It had an unusually tall and narrow neck, with an unusually dark brown coloured glaze around the neck and shoulder. This combined with the dramatic crazing all over the cream-coloured glaze of the bottle itself should have been enough to tell me immediately what I had. As I wiped the dirt away from all sides of the bottle with my moisture and soil-soaked work gloves, I saw what it was my afternoon of dirt-slinging had produced… a monkey shooting a seltzer bottle. I was holding a T.H.Hutchinson pint ginger beer bottle, of the scarce Brantford pottery variety, with one nicely smudged pictorial of a monkey shooting a seltzer bottle on the front. I was absolutely amazed! In our three years of digging in and around this dump, neither Kyle nor I had produced even shards of any soda bottles this nice. This was the only pre-1920s soda bottle that had come out of the ground so far, and it was an exceptionally nice one. The bottle itself was in good condition, with a few very small lip pings, and one 15mm flat flake on the rear base edge. It felt amazing to pull that rusty, dirty bottle from the ground after probably 90 years of burial. This piece emerged from the ground as a valued antique, after being buried as garbage in the earliest part of the 20th century. 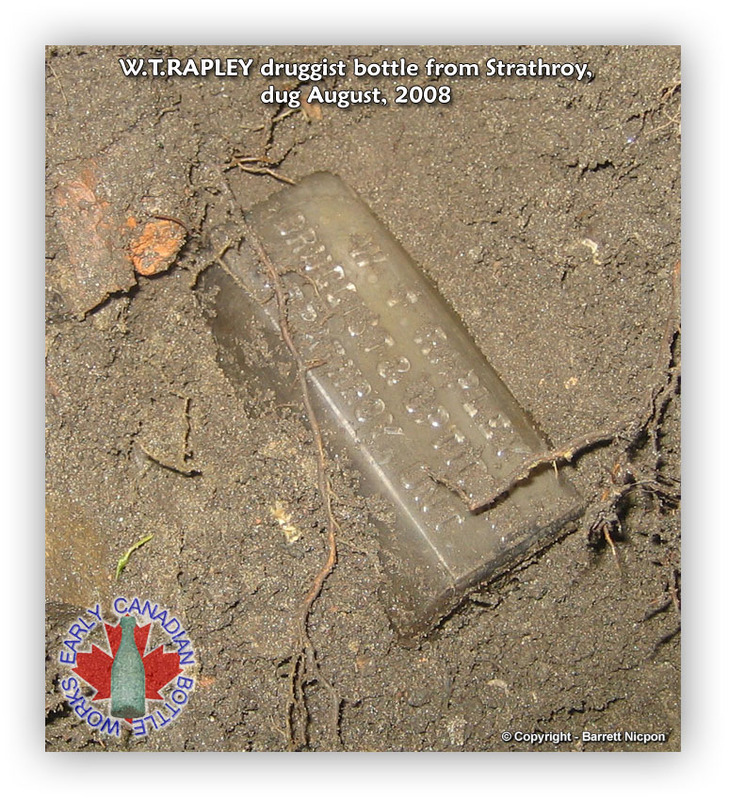 Being at the very base of the dump, and also being among the oldest bottles recovered to date from that location, I can only assume that this piece was probably part of some of the earliest refuse dumping at this spot.